Madhya Pradesh is the heart of India. It consists of the world's most amazing rarities. In this resource you will find, Topography of Madhya Pradesh. •	It occupies approximately a Central position in the Indian Map and comes under the North Central Zone. Its central position only gives it a name Madhya, meaning center in Hindi. •	The bordering states are: - Rajasthan in the North West, Gujarat in the West, Maharashtra and Andhra Pradesh in the South, Chhattisgarh in the East and Uttar Pradesh in the North. •	It is the second largest state in India after Rajasthan. •	Area: - 308,209 sq km or 119,000 sq mi. •	The capital of MP is Bhopal and the state has 48 districts in total. 1. About 33% area is under forests. 2. About 45% is Net Sown Area. 3. About 56.7% is Gross Cropped Area. 4. About 9.6% of land is Not Available for Cultivation. Paddy (Rice) is under the widest cultivation of Madhya Pradesh. It is followed by Wheat, Maize, Jowar and Bajra. 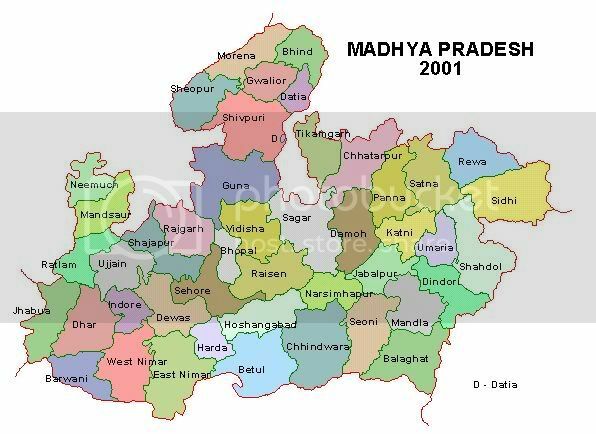 Here you can find information about Population and Ethnic composition of Madhya Pradesh. Madhya Pradesh has a very dense and the most wide forests in India. In this post you will know about the Forest and Wildlife of Madhya Pradesh. You can also find a list of National Parks in Madhya Pradesh here. There are three classifications of Forests on the basis of their value. They are Reserved Forests, Protected Forests and Unclassed Forests. There are many important rivers which cross through Madhya Pradesh. Narmada River is the most important of all and is knoen as the lifeline of Madhya Pradesh. Madhya Pradesh caries a long and reputed history to 21st century. In this resource you will come to know that how and when Madhya Pradesh was formed?, Famous Personalities of Madhya Pradesh etc. This resource is a must read to know most basic facts of Madhya Pradesh. The above resource has been verified by ISC’s Editor on what basis as in brief profile shows the number of total district in Madhya Pradesh is 61 and it’s below 48 districts. If I consider the above post is authentic then I am doing mistake and at this stage how I can refer other published information / data. If the above resource has been verified by ISC Editors, which shows the editors is also not aware about Madhya Pradesh. This reflect the resources on this sites are how much authentic. I would request to ISC’s editors please avoid such type of mistake during approval of resources to avoid unnecessary confusion for visitors. Please refer the link http://archives.nic.in/madhyapradesh/profile.htm from which the above details has been taken by Author but he was not aware the information provided on site is old and require to update. I request to all member please refers any site for reference but don’t forgot to update the information. First of all, thankyou very much for correcting me. But you should not go aggresive for this mistake. I am sorry if this information of mine caused you or any other visitor any sort of harm. Instead of sorting out such little mistakes, please try to post a better resource about Madhya Pradesh Profile if you can. I really welcome such posts from you.